What comes to mind when you read the word "automatic"? I came across the term in Mark 4:28 "All by itself the soil produces grain—first the stalk, then the head, then the full kernel in the head." The phrase "all by itself" is αυτοματη (transliterated is "automate' "). We get our words "automatic" and "automatically" from this Greek term. It is used only one other time in the New Testament--Acts 12:10 "They passed the first and second guards and came to the iron gate leading to the city. It opened for them by itself, and they went through it. When they had walked the length of one street, suddenly the angel left him." You recall this is Peter being led out of prison by an angel. The iron gate opened automatically (same word found in Mark- αυτοματη). Back to Mark 4:28. Jesus is telling another "seed" parable. This time he highlights the energy in the combination of soil and seed. Something automatically happens; something is done "by itself," that is, without the farmer's help. The farmer sows and sleeps, sows and sleeps and things happen beyond his control and without his contribution. Jesus is speaking about "the kingdom of God." Mysterious forces are released that even the farmer does not know. He does his part, but then the seed and soil do so much more. The seed is and must be out of his hands. In pragmatic USAmerican evangelicalism, the last thing we truly believe is that if we let go, God, in his creative mysteries, will still be at work. We are conditioned to believe that we've got to "run things," "be in charge," "make things happen," "take the hill." We, leaders and pastors, think and act like we have to have our grubby little fingers all over people's growth in God. We analyze growth, systematize growth, facilitate growth, calculate growth, evaluate growth, ad nauseum. Because of our entrenched pragmatism and the itch for quick results, we stupidly try to hasten growth. We transfer the concept--"automatically"--to our frenzied methods hoping that the right "steps" and "fill-in-the-blanks" will promote transformation. We forfeit the restful contentment that God is doing what we could never do. We resist hiddenness, seasonal slowness, and mysterious energies we can't control. We want harvest yesterday. Yet, God will not be "automatically" tied to our hurried methods. We either adjust to him and his ways or lose sleep and drive people crazy urging them to grow. Don't get me wrong. We aren't called to be lazy. That is nowhere in Jesus' parable. We must do our part. We should do it well and faithfully. Yet, God, also, has his part to do. Some plant, others water, yet God and God alone brings the increase. We can sleep on it. Good reminder. i've been wishing there were three of me so i could initiate all the growth "programs" i think are needed. Thank God there aren't three of me! Thanks for this. It is settling down to ferment with some similar thoughts I've had of late. We'll see if those ramblings mature into anything worth my writing down. When I read the "seed" parables today, I often wonder how many people think of them as "quaint" or "outdated"? 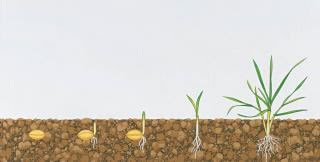 I mean, with all of our modern science and technology, it is easy to believe that we understand everything about seeds now - their genetic makeup, the internal workings of their cells, how and when to plant them and fertilize them and keep the weeds down. We've studied and mechanized the whole process to the point where some (many? most?) would think that the "mystery" Jesus talks about with seeds was simply that He was missing MiracleGro and Weed-B-Gon. What we miss in our process to explain and control everything on earth is this, and it's simple - the mystery is that the seed exists AT ALL. But you've got the Big Three on your side.Right? It seems the hell-bent aim of the Enlightenment was to demolish the very concept of mystery. Now with quantum physics, scientists find ourselves facing great mysteries once again. There are truly unseen, benevolent energies at work all around us and God is at work even when we aren't. Blessed be his Name! No God, No Peace; Know God, Know Peace. What an interesting post. I have given up on church and one of my big gripes is that "leaders" want to organise every waking minute of the thing. When I raise the idea of completely removing the entire leadeship layer and that God might actually be capable of running the church himself, I'm always greeted with the same response, which is "but how would you ensure orthodoxy?" "How would you ensure little groups don't just fly off into heresy?" What they don't seem to get is that 200 years of church leadership hasn't done much better, but more deeper it betrays a fundamental lack of trust that God could possibly manage all these little groups "of 2 and 3" Himself. I'm (nearly) at the point of thinking that all church "leadership" should simply be removed. Jesus said four words (English translation) that USAmerican church leaders basically ignore: "Not so among you." Look at these words in context and you'll see why current leadership models and issues are so distorted. I'm in Mi. Send me an email or if you have skype you can hit me at my name with the #9 right after it. Otherwise email me. John, Great post. It is so important that we realize what you're saying. Yes, we do our part, but wait. As George Muller, or someone like him said, God grows some things (weed) overnight, but an oaktree for a lifetime. Excellent comments. And a timely reminder for me too. I like your picture of a seed germinating into a seedling. We sow but it is the Lord who gives the harvest. Also it takes time for growth to occur.